I'm sure most of you have heard City Of New Orleans by Arlo Guthrie or Willie Nelson. It is the best known song written by Steve Goodman. He recorded it on his 1971 debut album. Sadly, Goodman died in 1984. So he never had commercial success though his albums are worth seeking out. He was born July 25, 1948 in Chicago. He began to write and perform as a teen. He also led the synagogue choir. He formed a cover band while attending the University of Illinois. Then he moved to New York in 1967 and sang in clubs. He returned to Chicago to go back to school. But then Goodman was diagnosed with leukemia and he decided to continue with music. He performed mostly at the Chicago club Earl Of Old Town and he sang jingles. This was when he became close friends with John Prine. One night Goodman was opening for Kris Kristofferson. Kristofferson liked what he heard and he decided to help Goodman get a record deal. Kristofferson introduced Goodman to Paul Anka who paid for demos. Those demos got Goodman a deal with Buddah Records. 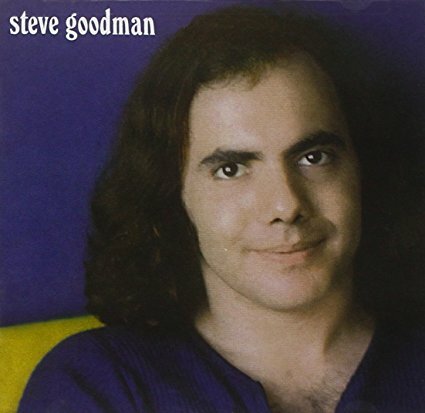 Steve Goodman was his debut album. The album was produced by Kristofferson and veteran Nashville session bassist Norbert Putnam with Kristofferson's band. The album is available as a budget CD. One night Goodman was opening for Arlo Guthrie. Guthrie told Goodman he could pitch him a song if he bought Guthrie a beer. That song was City Of New Orleans and it guaranteed Goodman's financial security. He recorded two albums for Buddah and several for Asylum. In 1980, he started his own label which is run by John Prine. Steve Goodman died on Sept. 30, 1984 at age 36. Goodman was a huge Chicago Cubs fan so his ashes were scattered at Wrigley Field. You know that song Go Cubs Go? Goodman wrote it. Also check out Clay Eals' 2007 biography Steve Goodman: Facing The Music. He'll be happy I finally did Steve as SOTD. Here's Steve Goodman performing City Of New Orleans on The Old Grey Whistle Test 1972.